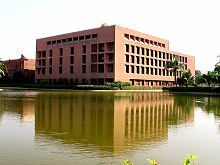 The Aga Khan University (AKU; Urdu: آغا خان یونیورسٹی‎, Sindhi: آغا خان يونيورسٽي‎) is an independent research university with its primary campus in Karachi, Pakistan, with additional campuses and training programmes in Kenya, Tanzania, Uganda, United Kingdom and Afghanistan. Founded in 1983 by the Prince Aga Khan IV through the Aga Khan Development Network. The university launched a medical college and a teaching hospital on a 65-acre site in Karachi. The university over the years expanded, in 1993 It established the Institute for Educational Development, Pakistan, in 2004 It established a teaching hospital in Nairobi and in 2016 another one in Dar es Salaam. In 2002, the university established a campus in London dedicated to the study of the Near East and in 2003 launched an examination board. In 2015, the university established the Institute for Human Development funded by the CIDA, and in 2016, the university launched the Graduate School of Media and Communications. In 2016, the university launched the East African Institute. The university's clinical laboratories in Karachi are the only in Pakistan to be accredited by the College of American Pathologists. The universities campus in Karachi is ranked among the top 185 universities in Asia and among the top 300 in the world for medicine by Quacquarelli Symonds. The Higher Education Commission of Pakistan ranks the university as the top medical school in Pakistan. The university runs one of the world's largest networks of Joint Commission accredited teaching hospitals, with 14 hospitals in Pakistan, East Africa and Afghanistan, in 2016, these hospitals treated 1.75 million patients. The Aga Khan University accounts for 75% of all biomedical research in Pakistan while the remaining 25 percent is shared by all the other institutions. AKU publishes more research articles in peer-reviewed, indexed internationally recognised journals than any other university in Pakistan. Faculty promotions are dependent on publications in indexed journals while most medical students have published by the time they graduate. Undergraduate medical students have published up to 50 research papers in indexed health journals. It is the one of the few universities in Pakistan to provide research facilities to students at the undergraduate level. The university maintains a research office to guide and support research conducted at the university. A University Research Council also funds grants after a competitive review process facilitated by a Grants Review Committee. Particular emphasis is also placed on community related health sciences research. AKU organizes international and national research workshops and seminars. A Health Sciences Research Assembly is held annually in which faculty and students present their research. The university is a site for NIH clinical trials. The seal (logo) of the Aga Khan University is a visual representation of the principles which underlie the founding of the university. The circular form of the seal has its roots in the rosettes of early Islamic periods. It also symbolizes the world and reflects the internationality of the Aga Khan University. At the centre of the seal is a star or sun representing light – a universal symbol of the enlightenment that education provides. The light is also symbolic of Nur (divine light). The star incorporates 49 points to commemorate the university's founding by Prince Karim Aga Khan, the Forty-Ninth imam of the Ismaili Muslims. The outer ring circumscribes a Quranic Ayat (3:103) rendered in classic thuluth script. AKU-IED is a center for developing teachers, educators, education managers, researchers and policy makers. Apart from teacher training, AKU-IED offers M.Ed (Masters of Education) and PhD. in Education as well. Established in 2003. AKU-EB is a federal Board of Intermediate and Secondary education in Pakistan. AKU-EB examines students at SSC and HSSC level. Aga Khan University's Karachi campus. The Aga Khan University is an international university, operating on campuses in Central and South Asia, the African Great Lakes, Europe and the Middle East. In Pakistan, the university is an 84-acre campus including a hospital with two on-campus male and female hostels with a capacity of 300 each. It has a sports and rehabilitation center which is one of the best in Pakistan, with an Olympic-standard swimming pool, cricket practice nets, tennis courts, indoor gymnasium with wooden flooring, squash courts and gyms. It has cricket and football grounds with jogging tracks. A USD 500 million campus for the university's Faculty of Arts and Sciences is under development in Karachi, Pakistan. An area of 1,100 acres (4.5 km2) has been acquired just outside Karachi, and Payette Associates are the project architects. Rizwan Sohail, Professor Of Medicine at Mayo Clinic College of Medicine and Science. BBC News: "AKU, Leading the Y2K campaign"
BBC News: the remains of a Persian Princess found in Pakistan were X-rayed at AKU. Dr. Jeffrey Rees of AKU was interviewed by the BBC; however, CAT scans done at AKU confirmed the mummy to be forged. ^ "AKU values". Retrieved 6 September 2016. ^ "About AKU". Retrieved 6 September 2016. ^ "Aga Khan University | Aga Khan Development Network". www.akdn.org. Retrieved 8 January 2017. ^ "2016 Convocation". Retrieved 8 January 2017. ^ "Institute for the Study of Muslim Civilisations (ISMC) | Aga Khan Development Network". www.akdn.org. Retrieved 8 January 2017. ^ "Examination Board | Aga Khan Development Network". www.akdn.org. Retrieved 8 January 2017. ^ "Institute for Human Development (IHD) | Aga Khan Development Network". www.akdn.org. Retrieved 8 January 2017. ^ "The Journey". Aga Khan University. 18 May 2015. Retrieved 8 January 2017. ^ "East African Institute | Aga Khan Development Network". www.akdn.org. Retrieved 8 January 2017. ^ "AKUH labs become first Pakistani lab to be recognised globally – The Express Tribune". The Express Tribune. 28 February 2017. Retrieved 28 February 2017. ^ "Aga Khan University". Top Universities. 16 July 2015. Retrieved 8 January 2017. ^ "University hospitals network | Aga Khan Development Network". www.akdn.org. Retrieved 8 January 2017. ^ a b "Need stressed to promote research". Dawn (newspaper). 29 March 2007. Retrieved 11 August 2017. ^ "NIH trials at the Aga Khan University". Retrieved 11 August 2017. ^ "The Seal – AKU Convocation 2006". Archived from the original on 6 February 2007. Retrieved 11 August 2017. ^ "HARVARD TO AID IN DEVELOPING PAKISTANI TEACHING HOSPITAL". The New York Times. 21 December 1981. Retrieved 11 August 2017. ^ CSPH Names Adil Haider, MD, MPH as New Director. Brighamandwomens.org. Retrieved on 2016-07-03. ^ "Dr. Naeem Rahim, MD". Health Grades. Retrieved 19 April 2015. ^ "Rahim Farhim and JRM Foundation reach out". Idaho State Journal. Retrieved 19 April 2015. ^ "M. Rizwan. Sohail, M.D." mayo.edu. Retrieved 5 April 2018. ^ "AKU leading the Y2K campaign". BBC News. 24 August 1999. Retrieved 11 August 2017. ^ "The Mystery of the Persian Mummy". 20 September 2001. Retrieved 11 August 2017.